Facts about Savanna monitor lizard. "Scientific name for Savanna monitor lizard is Varanus exanthematicus". 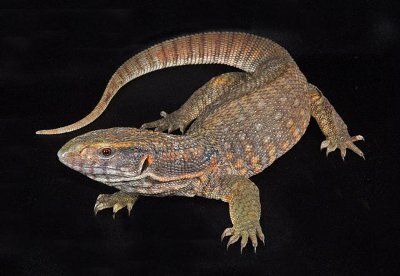 As the Bosc's monitor in Europe, the Savanna monitor lizard is a docile, medium, sized lizard hailing from Africa. The Savanna monitor aren’t the active types of lizards, that is why, they often tolerate human handling them. The Savanna monitor lizard are thought to be originating from dry and hot parts of savannah. The Savanna monitor lizard are fun to look and they keep themselves busy during the day by burrowing into the soil, basking in the sun and hunting smaller lizards, rodents and insects. If you have a Savanna monitor lizard in your home, keep checking on its weight because they are prone to obesity just like many other reptiles. Feeding adult Savanna monitor lizards once per week is okay but juveniles should be fed up to four times a week for optimal growth. The Savanna monitor lizard are moderate growing reptiles, growing up to 130 cm (51 inches)long with the head-body length reaching up to 55 cm (21 inches). However, most of the average species are 100 cm (39 inches) in length. Weighing about 6 kg (13 lbs. ), the Savanna monitor lizard is a thick, well-proportioned monitor with a short neck and wide head. The tail isn’t that long and it tapers all along plus it features a doubled toothed crest. The Savanna monitor lizard can be grey or light yellow in color with the head featured by yellow markings. Along this monitor’s back, there are symmetrical rows of circular and dark-edged yellow spots. The tail of the Savanna monitor lizard is featured by alternating yellow and brown rings while underneath the limbs and the belly is characterized by gray, brown or yellowish-grey color. Its tongue is forked-shaped and it is often blue. The Savanna monitor lizard can be found mostly on trees and burrows because they are not only good soil burrowers but also excellent climbers. Though they are capable of digging their own burrows, they can claim those burrows dug and abandoned by other animals such as the squirrel. The Savanna monitor lizard can also be found in hollows of trees, termite mounds. The Savannah Monitor male is a territorial species and will always defend his territory no matter what. The coloration and pattern of the skin changes according to the local habitat. The Savanna monitor lizard have large body scales with more than 100 scales around the mid-body. Its laterally compressed tail has a dorsal ridge and nostrils, which are always equidistant from the tip of the snout and the eyes. The Savanna monitor lizard lives in most parts of sub-Saharan Africa from Sudan in the East to Senegal in the west and from Rift Valley to Congo River in the South. Throughout these regions, the mostly dwell in burrows and bushes. Most of the information regarding how Savannah Monitors should be fed is found in West African countries such as Ghana. The Savanna monitor lizard are molluscs and arthropods feeders. In Ghana, they feed mostly on small crickets for young monitors while the adult monitors preyed on amphibians, scorpions and orthopterans. In countries such as Senegal, these monitors feed on Lulus millipedes. The Savannah Monitor is commonly hunted for leather and meat, which are lucrative in the international trade. This is the main threat to this reptile.